Tears of Crimson is excited about this great book by Linda Rawlins, and we think you'll enjoy it as well! For our readers that enjoy Mystery and Suspense this is a great new release. Fatal Breach - Rocky Meadow Mysteries No 2 -Acting medical examiner, Dr. Amy Daniels and Father Michael Lauretta become entangled in murder at the local soup kitchen in Burlington, Vermont. As their intricate relationship develops, they are drawn into a sinister plot as FBI Special Agent Marcus Cain pursues a deadly internet activist group, known as Shepherd Force. They soon learn, the cybercrime organization will stop at nothing to retrieve an illegal flash drive worth millions of dollars. About Linda: As a child, I loved to read, whenever and whatever I could get my hands on. I started to write my own “Nancy Drew” type mystery in fifth grade. As a student, I studied Biology in Vermont, Sciences and Literature in college and eventually became a physician. I enjoy writing mysteries that contain medical and light spiritual content. Either way, a good murder mystery is always fun. My first book, The Bench, is set in the fictional town of Rocky Meadow, VT. 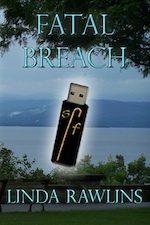 The Rocky Meadow Mystery series then continues with Fatal Breach. Dr. Amy Daniels is a former trauma surgeon from Boston who moves to Rocky Meadow, VT to escape family tragedy. There she meets, Father Michael Lauretta, the psychologist pastor of St. Francis church and Rocky Meadow Retreat Center. Together, they solve mysteries with the help of Katie, the church cook, Willow, a teenage millionaire and Father Victor, visiting priest from Chicago. In Fatal Breach, the characters become involved with a murder at a local soup kitchen. While solving crimes, the main characters deal with life, loss, starting over and developing an appreciation for the friends and loved ones in their lives. Linda Rawlins lives in New Jersey with her family. When she is not working in medicine, she is writing.